Here’s the thing though, how long does it take for us to respond to a request from our children? I know sometimes I am caught up with a sibling or cooking, reading a book or checking something on the computer and my child would like to play a game, read a book, go to the park or make a craft. Sometimes I ask my children to wait a minute or two so I can finish up a task or tend to a sibling’s need that came first. Do you ever catch yourself saying “just another few minutes sweetie,” or “I’ll be right there,” and the “right there” turns into a five minute wait? 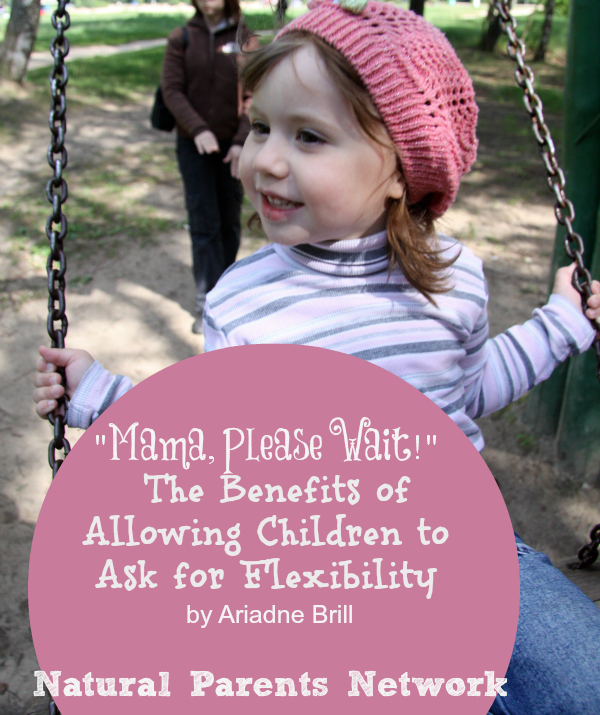 Read about why both asking for flexibility – and being flexible when our kids ask it from us – are a good thing, at my post today at Natural Parents Network: “Mama, Please Wait!” The Benefits of Allowing Children to Ask for Flexibility. One Response to Mama, Please Wait!